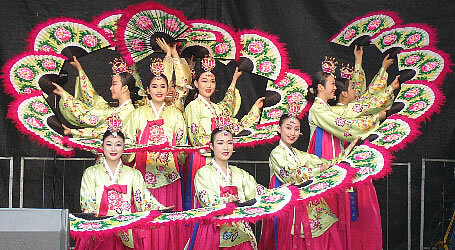 Mystic Korea: t do you think about " Pre-party glamour "
All women want to look good whenever they go out. As the party season is just around the corner, many of them start to worry about their party looks. 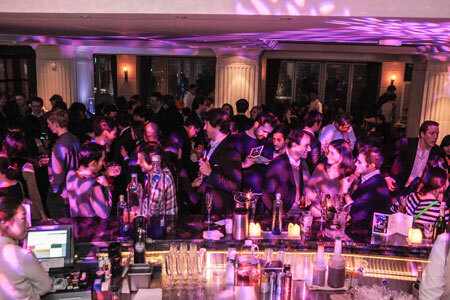 With the constant round of working late and after-work socializing, women often end up worrying about their looks even before heading off to parties. Now here are five must-have items recommended to freshen up the make-up bag and glam up the party looks. Now that the streets are decorated with sparkling Christmas lights, some women’s hearts are fluttering with festive feelings, and, as these begin to flow, attention turns to party frocks. Perhaps more than other times of the year, many women wish to stand out from the crowd and look their best. They’ve chosen their dress with shoes to match, but for a complete look, they shouldn’t forget the artistry of makeup. “The three most important things to remember about party makeup are time, place and situation,” makeup artist, Kim Hwal-ran of Musee Neuf in Gangnam, southern Seoul, said last week in an interview. causes a subtle mother-of-pearl sparkle on the lips, while protecting them with a formula of nourishing oils. “It’s my favorite gloss so far. Not sticky at all and I am impressed with the staying power of the product (was over eight hours and going strong) and the amazing color — is so natural looking but also has fine gold sparkles,” Ashley Shone, a 25-year-old office worker in London, said Thursday in an email interview. Kim Sun-a, a freelance makeup artist based in London, recommends two necessary makeup items for working women who attend parties straight after work. 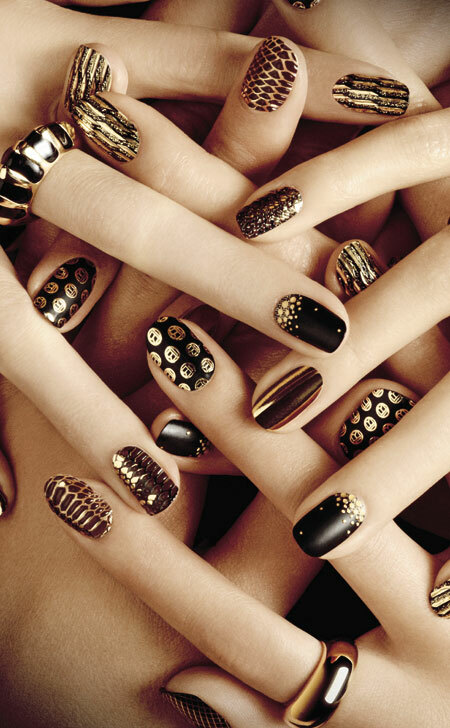 L’Oreal’s 3D-effect Color Riche Le Nail Art Stickers, released in December, are available in six designs. It is a new solution for women who don’t want to leave their nails bare. Applying them is very simple; choose a sticker size that best suits the nails, then peel them off the paper and position the sticker at the base of the nails. Once applied, smooth it across the rest of the nail. File the self-adhesive part, and it’s done. “I seldom apply nail polish because I have to wait for the nail polish to dry. When I first applied these nail stickers, I thought they were very gentle and safe to use on bare and even gelish nails. They do not hurt my nails, even when I am peeling them off, I love it,” said Lee Min-sun, a wedding planner, said Friday in an interview. With such vibrant nails, blush can help highligh a woman’s face. 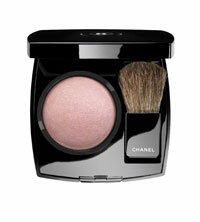 Chanel’s Joues Contraste in Star Dust is the latest powder blush from the Chanel Holiday 2012 Makeup Collection: Eclats Du Soir De Chanel. It’s a pale, soft pink with a multi-colored iridescence and a gorgeous subtle satiny sheen finish. Arguably the most fun part is applying eye makeup. For those who want to look perfect but don’t know what color eye shadow would look best, below is a palette of a dozen eye shadow colors, hand-selected by Laura Mercier, in shimmer and matte finishes. 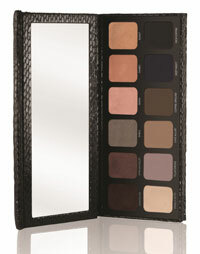 Laura Mercier’s new Artist’s Palette for Eyes consists of two rows. The top one features a range of dark to light shimmer shades in Chocolate, African Violet, Sable, Guava, Cameo, and Sunlit. The bottom row includes light to dark matte finishes in Vanilla Nut, Plum Smoke, Cafe au Lait, Coffee Ground, Deep Night, and Rich Coffee. There’s enough variety to do several different looks from basic wash to smokey and the dark colors can make liners used wet. “One thing to remember when dressing your eyes is the eyeliner and eye shadow should be the same color. 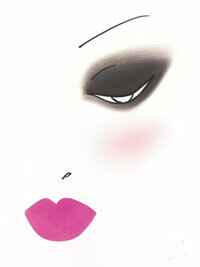 If you are using shades of blue, try navy eyeliner, it will look very sophisticated and modern,” said Kim Hwal-ran. There’s no reason why the make-up brushes have to be big and boring. Bobbi Brown’s cute Mini Brush Set will freshen up the make-up bag, and it is the perfect size for popping in a handbag or for partying. Contains a mini blush, eyeshadow, eyeliner and lip brush. 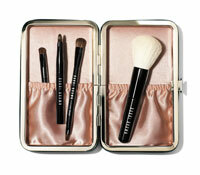 The blush brush is dense enough to pick up color and blend it in very well. The eye shadow brush is the perfect size for applying lid color and highlight to small Asian eyes.